The mechanic jumpsuit, team jersey and race credentials from Team Shaklee and the USPro Cycling Championships in Philadelphia – 1999. Jim O’Brien had a friend who was connected to NASCAR who custom made our mechanic jumpsuits. While grilling tonight I needed something to flip the steaks. I was in a fun mood so I grabbed the Park BBQ-2 grilling tongs I have. I’ve had them for a while, but figured I’d use them tonight. 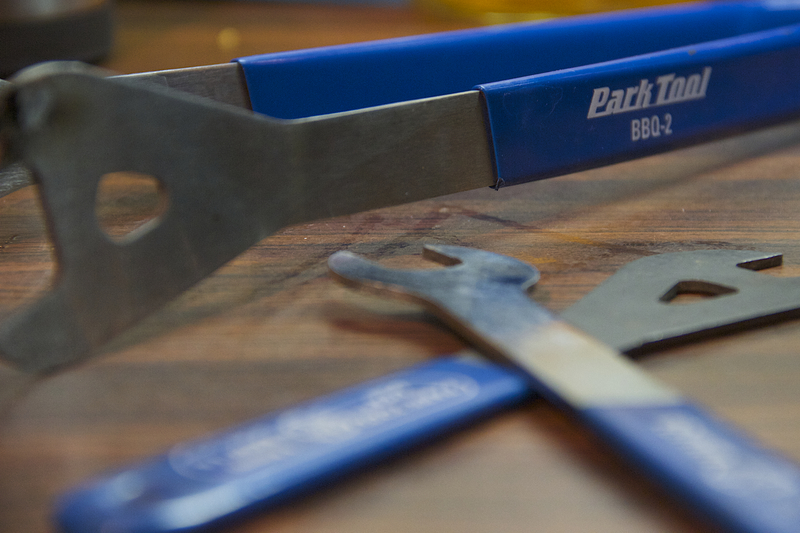 My daughter started asking about them so I began explaining how they’re made from actual bicycle tools – so I had to show her my set of tools that matched the BBQ set. I just think it’s cool. And, of course, this got me thinking about my time with the pro cycling team. It’s not something that a lot of people know about me, but I was the head mechanic for a professional US domestic cycling team for 2 seasons. It’s something that I’m rather proud of since I had no formal training and essentially taught myself what I needed to know to get to that point and certainly learned a crap-ton from then head mechanic Jim O’Brien of The Right Gear (awesome mechanic and the real deal). Unfortunately, I don’t have a lot of photos from that time in my life because I was more focused on cycling than I was on photography. But I do have a couple fun stories from my first big race. It was the USPro Cycling championship back when it was in Philly (1999). Shaklee wasn’t a huge team and certainly didn’t have a huge budget, but we did have some quality guys on the team and it was lots of fun traveling with them. Some of the guys on the team chose to ride their own machines as opposed to the team-issued Marin bikes. This caused issues when it came to spacing the wheels for the follow-car. I had to space the majority of the wheels to fit the favorites on the team so if/when they had a flat, the wheels were ready to go. This all went out the window when a guy riding a non-issued bike flatted. I then had to spend extra time properly spacing the quick-release to the bike when I should be just closing it and sending the rider on his way. As luck would have it, a teammate on a non-issued bike flatted. And he flatted on the most visible part of the course – the start/finish stretch where the biggest crowds were. This was my moment to prove to the world that I could do it. The team manager and director sportif were awesome and confident that I was going to be fine. And I was – considering I had to re-space the quick-release on the fly. I wasn’t thrown off by the wheel change. I wasn’t thrown off by the thousands of cheering fans. I wasn’t thrown off by the cameras on motorcycles surrounding me. I was, however, thrown off by the commentator (I think it may have been Al Trautwig) who drew everybody’s attention to the wheel change and did what any good broadcaster would do. He began educating the masses on what was happening and engaged the crowds by starting a count to demonstrate to the crowd how quickly race mechanics change wheels. The second big incident happened in the same race, but I think the following year. Anyway, it involved another wheel change. This is the kind of thing that you just have to laugh at (even when it was happening). I had a rider (Eric Wohlberg) who had a slow leak and needed a new wheel, but he just had to figure out when was a good time to change it. He decided on The Lemon Hill section of the biggest one-day race (at the time) in the US. This was a section where the fans lined the roads with no barriers as the cyclists entered the park. Or, at least we thought he had decided on that section. It turns out, he hadn’t chosen that point. The race was just slowing down. Didn’t matter, I was already out of the car wheel in hand. My follow-car driver had a different plan though. He was still moving and was shouting at me to get back in the car. But, you see, I couldn’t. He had just driven onto my foot. Awesome. Well, that was a fun trip down memory lane. Good times. I’m hoping that the drive I had back then still exists so I can take a third hobby and turn it into a new career.